We strive to teach wellness concepts and physical skills that will inspire students to embrace a proactive and healthy lifestyle. Elementary students participate in PE twice a week, with a special motor lab for kindergarteners to further develop their motor skills. Some of the units of study include jump rope, bowling, tennis, foursquare, basketball, volleyball, softball, and physical fitness. All students are encouraged to participate and increase their skills. VCES is committed to creating a classroom environment that speaks to the needs of active young learners – especially the need to move. All classrooms have a kid-sized fitness bike that is in constant use throughout the day. Several teachers are currently piloting standing desks and core strengthening sitting options. Teachers have also begun integrating several ways to give students ample time to take “body breaks” and time to move throughout the school day. In addition to our regular, specialized PE Classes, Little Warrior Nation is an exciting extracurricular opportunity for VCES students to learn the fundamentals of a wide variety of sports, and learn to facilitate the necessary physical, social, emotional, moral, and spiritual development important to becoming a successful Christian athlete from some of the best coaches and high school athletes in California. VCHS coaches and student-athletes travel to the elementary to share devotions, testimonies, and lessons on effort, teamwork, and sportsmanship. Little Warriors’ big buddies in the high school oftentimes pray for them and send notes of encouragement. Our “Inside Look” special event allows fourth and fifth grade Little Warriors to sit on the bench with high school athletes at a game of their choice. 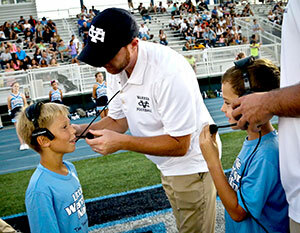 Most importantly, elementary students learn firsthand what it means to be a Valley Christian Warrior.